Ohio State U. students gather for a group portrait after a rafting trip on the New River in West Virginia. 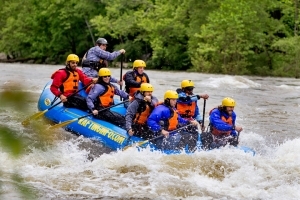 While for some folks April and May might seem too cool for a whitewater-rafting trip, college students don’t mind at all and account for a large part of spring rafting enthusiasts, according to the owner of an outdoor-adventure resort on the New River in West Virginia. Students blowing off steam before finals make up a perennially large part of the spring rafting audience, says Heather Johnson, vice president of River Expeditions. “Many rafters who book with us in spring are students from universities looking for a way to relieve pressure before the end of the spring term,” Johnson said. Penn State, Lyndon State , Virginia Tech, Southwest Michigan College, and Louisburg College account for a large part of the resort’s out-of-state student rafters, she said, while WVU-Tech and Marshall University are regular in-state schools. Johnson, whose family has been guiding on the New River since the 1980s, says students continue to be among their most prolific customers. 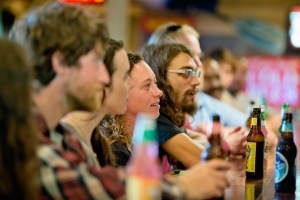 River Expeditions offers annual weekend rafting packages for university students that include a barbeque after the raft trip as well as two nights of camping, a light daily breakfast, and complimentary beverages at the The Red Dog River Saloon & Grill. In addition to rafting, they offer zipline tours, rock climbing, mountain biking, and a paintball field on a 100-acre basecamp at Fayetteville near the rim of the New River Gorge. 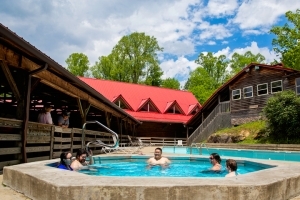 The basecamp center also includes a dining hall, outfitters shop, meeting facilities, and an outdoor pool and hot tub as well as the saloon and grill, and students are welcome to stay in their choice of campgrounds as well as dozens of basecamp rustic and deluxe cabins. For more information on rafting packages for university students or for general information on River Expeditions, call 800-463-9873 or visit their website.